Recipe Process Wash rice thoroughly (3-4 times) . Boil water in a vessel. Add washed rice and cook till soft( keep it slightly more soft than regular rice ). Drain off excess water. Add sufficient fresh water to completely cover the rice and allow to stand for 2-3 hours. Add diced onion, green chilli, curd and salt to the rice. Heat oil in a pan. When it starts smoking, add cumin seeds and curry leaves. Pour the contents over the rice and garnish with coriander leaves. Eat with roasted papad/badi chura, spinach bhaji or fried ladies finger or any stir fry/poda. 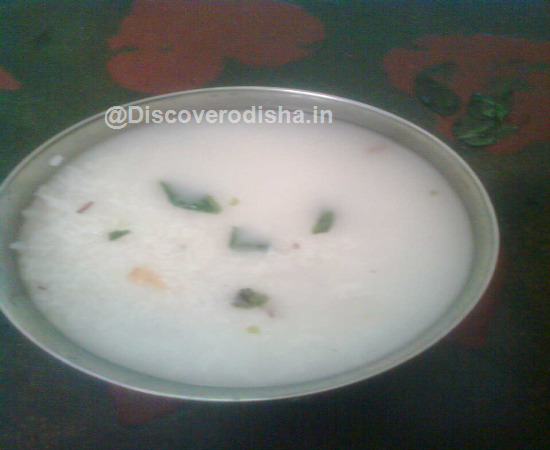 Recipe Ingredients Par boiled rice ( 1/2 kg ), curd (200 ml), onion ( 1 medium, diced ), green chilli (2-3 nos), curry leaves, coriander leaves,cumin seeds (1-2 tsp), salt to taste.